whole days of sunshine. Of course with it being mildly warm my first thought was "I wish I had more summer clothes" because when is anyone actually ever happy with the clothes they already have in their wardrobe? Each season comes around I convince myself I don't have any nice clothes to wear for that season even though I only bought myself a whole new wardrobe for said season a year before. I feel like the last year, maybe year and a half I have found my style, a style that is not a replicate of the ones I have seen online or in magazines. My style is quite business casual with a lot of blouses and I have a very big love for cigarette trousers, but it is also very feminine with floral prints, floaty dresses and skirts and a lot of frills, ribbons and belts. 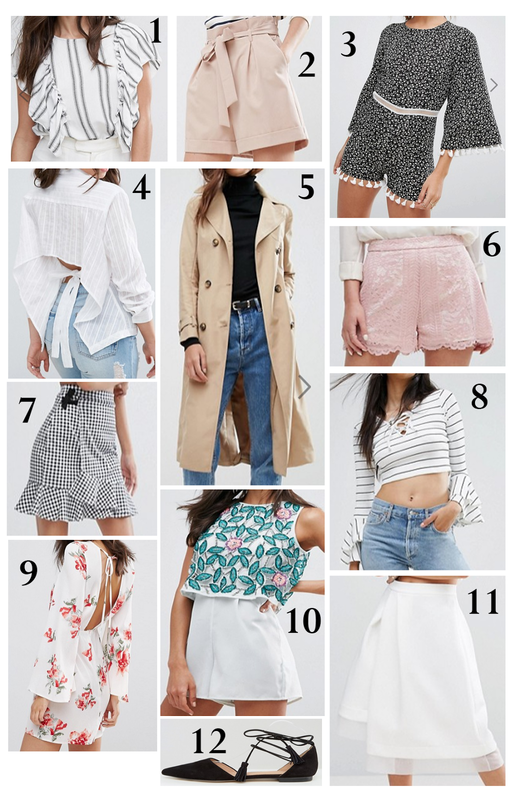 When it comes to my summer wardrobe at the moment it is filled with a bunch of vest tops and denim shorts, so I thought the best place to look to for a new summer wardrobe would, of course, be ASOS, one of my favourite places to shop online. Can you tell I am desperately trying to minimise the amount of black and white items on this wishlist? Each wishlist I do usually consist of far too many black and white items so in the spirit of summer I tried to pick as many patterned and colourful items as I could which is why there are so few black and white items. I love the thrills on number one, they make the piece much less bland, but I do love myself some stripes which everyone probably knows from how often I wear and feature them on here and my Instagram. Although the playsuit marked number three is black and white I don't think it is quite as boring as normal black and white outfits and the pattern almost makes it summery, especially with the cute detailing around the hem and sleeves. I love pink right now, it is such a beautiful colour especially the more pastel shades of the colour which is in this season. I love how the shorts in two and six are pretty normal looking shorts and have nothing quite spectacular about them except their gorgeous colour. I think these shorts would look amazing with a white vest tucked in or at the beach with a bikini top on top and a cover up on top. I have actually seen this shade being referred to as 'millennial pink' and I'm fine with it, if you're going to insult me with 'millennial' then at least associate me with something so bright, cheery and pretty. 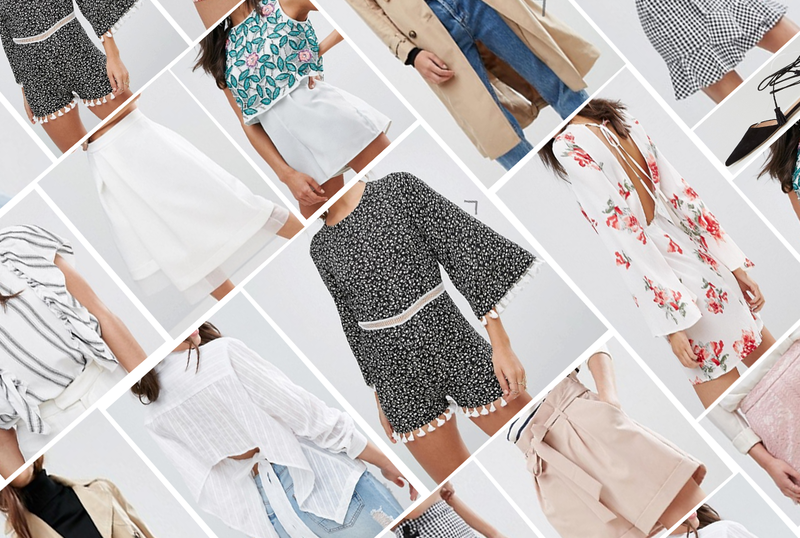 Florals for summer? Groundbreaking, ah if only copyright allowed me to post a fantastic Meryl Streep gif right here, but I will not because I am not a rule breaker. I love florals if they are done right. Sometimes it can look like a florist threw up on some items of clothing to me, but I am obsessed with nine, that beautiful bohemian chic dress is the perfect addition to any summer wardrobe. It's pretty, it's girly, but it is also unique with the whole backless thing going on, I love it, although tan lines may be weird. I have gone all Olivia Pope lately, I love wearing white and find myself adding a lot of white to my wardrobe which is unusual for someone who wears 99% black. I love a good shirt, but sometimes they can look super masculine so I am obsessed with the spin on the classic shirt being made with four. It is just a normal shirt, but it is higher at the back and has a gorgeous little bow making it look super feminine and unique, I am obsessed, plus how good would this shirt look with some good deep blue denim jeans on one of the colder summer days? The one thing I am missing from my summer wardrobe is a summer coat. I have blazers, I have leather jackets, I have shirt jackets, but I do not have a lightweight coat for those stormy summer days where it is warm, but raining. I am obsessed with macs and have been for the longest time, I blame my childhood obsession with Inspector Gadget, so when I saw number five I added it to my basket so quickly. Isn't it gorgeous? The perfect length and it definitely look warm, but not winter coat warm. So what are your favourites from my wishlist? What items or trends are you adding to your wardrobe this summer?